As you can probably tell from my lack of blogging, the last week or so has been a doozy. I’ve been trying to remember if this is typical for the end of the first quarter, but I’ve just been feeling SUPER overwhelmed at work and “behind” in just about every area of my life. At times like this – and everyone hits them at some point – I start questioning whether I can keep up, if maybe I’m “not cut out for this” anymore, and if, perhaps, I should look for a less “demanding” job. BUT, deep down, I know I’m in the right place. This too shall pass. This post is as much for me as it is for you; but, maybe you get it… Maybe you’re here too. Whether you’re overwhelmed with “to dos” like I am or simply have a class you’re struggling to connect with, I hope you’ll find some inspiration in the 7 tips I’m sharing below. We ALL get stuck. We ALL have hard classes sometimes or dig a hole that feels too deep to climb out of. Thankfully, it’s never too late to set things right. This seems pretty basic, but it cannot be stressed enough. When I’m overwhelmed, my natural tendency is to want to fuel up on caffeine and push through in the name of “getting stuff done.” Sleep seems counter-active to my massive To Do List. BUT, nine times out of ten, that list seems SO much more manageable after a good night’s sleep. I am kinder, less stressed out, and MUCH more productive when I’m taking care of myself and getting the rest my body (and brain) needs. Write it on your list. Go to bed. You know the drill : if something isn’t working, stop doing it / get rid of it. Move a set of papers to the next nine-weeks. Throw out a unit that feels too rushed or random. Give up on a routine or discipline plan that doesn’t seem to be cutting it for a particular class (like that time I stupidly tried to keep up with “tickets” for bathroom breaks). Ask your principal to take you off of a committee. I tell my students all the time that the best students (and, in this case, teachers), know that sometimes something simply has to give. If you can’t keep up, take something off your plate. Consider this your permission. *If you’re overwhelmed and can’t feasibly do this at school/work, consider taking something off your plate at home or in your personal life instead. You can cook dinner/represent the Junior League/train for a half marathon later. This may not work for everyone, but I find that being honest and sincere with my students (and my bosses if needed) goes a long way. Apologize for the essay you still haven’t returned from the second week of school. Admit that you are human and fall behind sometimes too. *Most* of the time, students appreciate this vulnerability and will give you some grace (especially if you extend the same to them once in a while). If you aren’t connecting with a class, tell them. Be gentle and kind, but be honest. Tell them that you are frustrated/disappointed/concerned and ASK them what needs to happen to fix the issues. Give them a chance to voice their frustrations and concerns too. Listen. In the end, remember that you CAN start over. Every day is new. Personally, I’m a big fan of using the start of each nine-weeks (when I’m finally caught up on grading) as a fresh start. It’s a great time to review class procedures and policies and to create a new grading schedule or routine for yourself. Sometimes, I’ll even tell my students – “Look, we’ve gotten off on the wrong foot, but let’s start over.” They get that. Whatever you do, DON’T let yesterday’s issues keep you from moving forward. Don’t hold a grudge. As you know, back-to-school season is in full swing these days, and the start of another school year brings a fresh crop of NEW TEACHERS! Last year’s post 20 Things to Know Before Your First Year Teaching High School has, naturally, gotten a lot of attention lately; and, I’ve gotten several emails from first-year teachers. With their permission, I’m sharing a few of the questions I’ve received today + my answers in hopes of helping out other newbies too. In the comments, I’d LOVE to have some other veteran teachers chime in with your thoughts as well. QUESTION: I have been subbing the past year for middle school (7th and 8th grade), and I really like that age. Turns out I will be student teaching for high school, which I’m not used to yet. I’m a little nervous! I’m 24 but I look younger. I think I’m worried that the high school age kids might not respect me as much because I look younger. Any advice? Boy can I ever relate to this!!! I was 23 when I started teaching ninth and tenth graders, and I looked about 14 (their age). It seems so silly now (especially since I look a lot less like a teenager and a lot more like a mom these days), but I was SO concerned about how I would be perceived by my students since I didn’t look much older than them – much less like someone with any authority over a classroom. It’s a totally legitimate concern; and, I’d imagine, a fairly common one… My advice is to dress professionally (probably more conservatively than a typical 20-something and more formally than the older teachers in your school), and to ACT like a teacher. Have high standards for behavior and consistently reinforce them in your classroom. Don’t fall into the trap of wanting to be liked and allow things like bad language (for some reason, I found that kids lost their normal “teacher filters” around me because I didn’t look like a teacher) or disrespect. The age difference between you and your students really isn’t very big, so you have to be especially careful not to treat them as peers – by talking too much about your personal life, getting involved in teenage gossip/drama, etc. Remember that you are THE TEACHER. You definitely don’t need to be MEAN, but you do have to establish yourself as an authority by setting (and sticking to) rules. Don’t apologize for that – it’s your job (and, truth be told, they will actually like and respect you MORE for it). The bad news is that you might be right – I actually DO think it was a little harder for me to get respect because I looked so young at the beginning. BUT, the good news is that that is temporary. I looked young for the first several years of my teaching career (still do really), but I stopped worrying about it after a while. Earning respect – from students and colleagues alike – is a right of passage for ANY new teacher. It takes a lot of effort and isn’t easy; but, once you’ve established yourself as an authority and a professional, you can loosen up a little (hello Casual Friday!). QUESTION: I would like to know how you handle those especially difficult students. Let’s say I have a wonderful class, but there is always that one disruptive student, that likes to slack off, and not pay attention… what have you done in the past with situations like that? I am going to be a first year teacher, and I think problematic students are my main concern. This is a great question and definitely a normal concern to have. It’s also not easy to answer because every situation is so different and may require a different approach; but, in general, I tend to ignore problem students as much as possible and give them lots of positive feedback when they DO participate, have a good day, etc. In my experience, those especially disruptive students really are just craving attention – maybe they are embarrassed because the class is really hard for them, maybe they are bored because it is really easy, maybe it has nothing to do with me/the class at all, but they have stuff going on at home. For the most part, I try to give my students the benefit of the doubt and look for some GOOD in them. Once I find it ;), I make it a point to point it out to them and encourage them whenever possible. If a kid is really smart and constantly makes comments to undermine me and make me feel dumb – I acknowledge his intelligence by asking him for help when I’m writing assignments or asking him to lead part of a discussion. 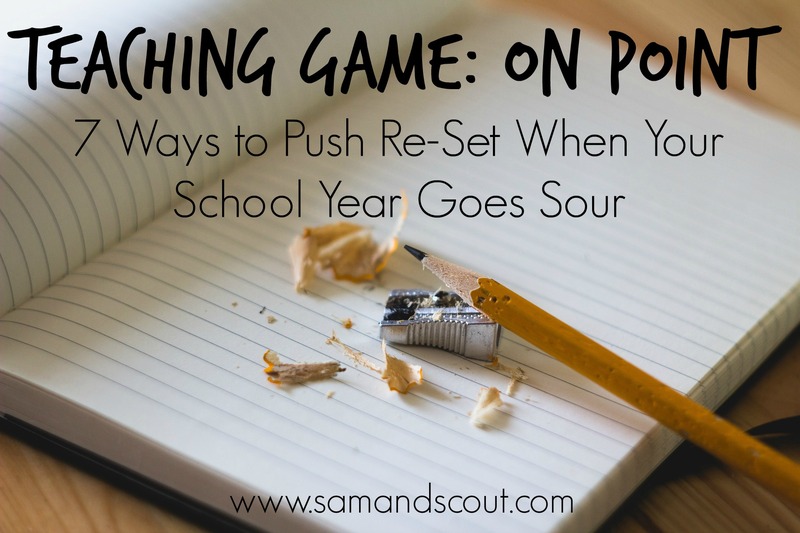 If a kid is constantly goofing off and not doing work – I check in and offer my help more often and also look for ways to let her “shine” in other areas (like making a poster for my bulletin board or even something simple like running an errand for me). I find that kids, usually, respond really well to words of affirmation, so I use them whenever I can and avoid making a big deal out of “bad” behavior. If that doesn’t work, I usually will ask a student to stay after class and try to have a on-one-conversation with him/her. In it, I’ll point out the positive traits I see, tell them how frustrated I am with the negative ones, and ask if there is anything else they’d like to tell me or ways I can help them. Usually this does the trick; but, if not, a call home almost always does. Only after all that do I get administration involved and go that route. (For more on my classroom management philosophies, check out this post.) I give it for the good, and don’t give it for the bad. I’ve also had some success chatting with the student one-on-one and encouraging them about the positive qualities I see in them. I talked a little about that in if you want to read more. QUESTION: What advice do you have for a new teacher facing a “Meet the Teachers” night before school starts? This night is making me really nervous, and I’m not sure how to exactly prepare for it. I also like to prepare a little power point with blurbs about the books I’m teaching, class rules, class materials needed, etc. to be scrolling in the background on my Activboard. This gives parents something to look at while others are arriving or you’re talking to someone else and gets across important information. This is a great time to introduce Remind.com too and invite parents to get out their cell phones and “text you” right then and there. *They will love this. 😉 If there is extra time, you can always take parents on a “tour” of your class website and show them where they can check for announcements, assignments, grades, etc. Especially if you teach younger students, the parents may be just as nervous about some of those logistics as you are! New teacher, you are going to do AWESOME! Just smile and remember… IT GETS EASIER. You’ve got this!! And, to the seasoned teachers… Please don’t forget about the new teachers in your building… Stop in to ask how you can help (and mean it). Smile at them! Tell them it gets easier. Invite them into your tribe and remember what it was like to be new. We need each other!! Today I’ve invited Linda of Teach 4 the Heart to share some of her best advice for classroom management. Linda is a former English teacher with a heart for Jesus and her students. She is currently staying home with her two young children full time (read about that decision in her last guest post here), but stays active in her professional life through her blog, podcast, book, and online course* (whew). When I first heard her talk about the concept she’s sharing today, it was like a lightbulb moment for me. This perspective change in the way that I pursue and maintain relationships with my students has been a slow process of maturing throughout my career; but, it has made a noticeable difference in my classroom, and it was so nice to have the words to explain the change. I hope you will find her message equally helpful and powerful! When you care deeply for your students, it’s easy to fall into a dangerous trap – the trap of trying to be their friends. The logic goes like this: I really care about these students and want to help them make good decisions. So I want them to feel like they can come talk to me. In order to make them feel comfortable, I need to befriend them. But there’s a big problem with that logic: Teachers aren’t supposed to be their students’ friends. It just doesn’t work. Imagine if your friend tried to assign you homework to do over the weekend. Or if the only fair grade they could give you on your essay was a D. Or if they had to hand you a detention. It wouldn’t go over so well, would it? After all, they’re your friend…. Too often, these teachers who had the best of intentions end up with a class that is out of control. So, if we shouldn’t be friends, what should we be? Are we supposed to just remain aloof and no-nonsense? What we need is a change of perspective. 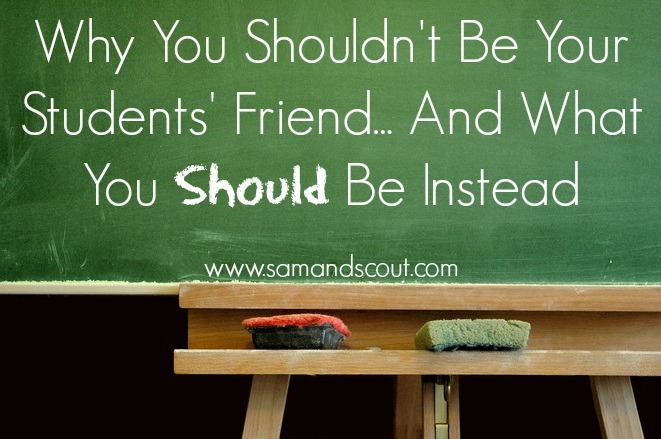 Instead of trying to be your students’ friend, strive to be their mentor. The difference is this: Friends are on the same level. They’re buddy-buddy, and they act similarly. So when you try to be your student’s friend, you have to act like a teenager to get down to that level. And, ultimately, you’re giving up your authority to level the playing field. A mentor, on the other hand, is not on the same level as his men-tee. There’s a clear distinction between who the mentor is and who is the men-tee. As a mentor, you guide your students, help your students, counsel your students, and care about your students. But your authority and respect remains intact. When you see yourself as a mentor, you’re not afraid to make tough choices or to tell the students what they need to hear instead of what they want to hear. As a result, you’re more effective in all areas and able to make a deeper impact in the lives of your students. So what do you think? Have you been trying to be a friend or a mentor? What needs to change in the way you view your relationship with your students? Don’t you love this concept?!? Linda is offering a FREE Classroom Management Webinar* Monday (2/29) at 8:45PM where she’ll talk about this in detail and so much more! I really whole-heartedly recommend her training and invite you to join me there next week. It costs you absolutely nothing but an hour (or so) of you time, and I promise it will be worth it! Sign up today* and mark your calendar! P.S. If you can’t make it Monday night – or the date has already passed by the time you’re seeing this – you can still sign up for the free 3 day Classroom Management Minicourse here and complete it when it works for you!! P.S. Have you noticed that my new blog design has a whole section under “Teaching” completely devoted to classroom management? Check it out if you want more on the topic while you’re waiting for the webinar. Before I jump in though, let me say this: I’m not an expert in this area AT ALL. Honestly, I think most of my classroom management comes from the fact that the students in my classes are generally really good kids. They are attending a speciality center in a program that they had to apply to and can get kicked out of if their grades/behavior don’t meet the criteria. Also, as a rule, they want to be here – so much so that they even wake up early to be at school at 7:30 every morning when their normal high school doesn’t even start until 8:30. These aren’t exactly your run of the mill teenagers. Of course, they sometimes fall asleep during class, try to text under their desks (like I don’t know what they doing in their laps), get way too loud during group activities, and occasionally give me lip. (They are, after all, teenagers.) But, for the most part, we have a pretty good groove going in my classroom most days…. 1. Mutual Respect. Often, by the time students get to high school, they have long-ago lost respect for their teachers. (Be appalled if you want to, but it’s the truth.) Gaining their respect cannot be done by enforcing rules, dressing/acting cool, or exerting power (trust me – I’ve tried each of those techniques as some point or another and failed miserably)… It can only (very slowly at times) be earned. Teenagers care SO much about being respected (SO SO MUCH). I promise you, the BEST thing you can do for your classroom management is to MODEL the respect you want for yourself. I don’t make harsh demands of students. I don’t yell. I don’t enforce (in my opinion) silly rules like “you may only go to the bathroom once a nine weeks.” I don’t even freak out if I see a cell phone on their desk (gasp). I talk to my students like they are human beings with lives outside of school. I get to know them – why were you up so late that you are sleeping through class now? I believe them when they say they didn’t get their syllabus signed because they haven’t seen their parents in two weeks. I give students the benefit of the doubt and, slowly, they begin to do the same for me. They listen when I teach and do the assignments I ask of them because they trust that my intentions are good and that I really do want to help them. They speak to me with respect, and they listen when I ask them not to do something. They “have my back” against their peers. It is ALL about mutual respect. 2. Tough Love. As much as I believe in the power of mutual respect, I still know that there are certain times I need to be the grown-up in the room; and, I have come to realize, that students really do WANT that from me. At the end of the day, no matter how much I love and respect my students (and I strive to make that evident 99% of the time), I am still their teacher. My job is to keep them safe, educate them, and prepare them for the real world. And, like it or not, there are rules and “un fun” things in the real world. I don’t have a lot of rules, but I do have a few that I consider detrimental and I enforce them consistently. (Ok, I try to enforce them consistently… This is, honestly, a struggle for me.) If you cheat on a test – you get a zero. If you call me a b*^#@$, I’m giving you detention and calling home. Every.time. Period. BUT, I’m not going to cause a scene about it, and I’m NOT going to hold a grudge. The next morning, I will greet you with a smile. When it’s done, it’s done. 3. Organization. If you’ve read many of my teaching posts, you know that organization and routines/procedures are extremely important to me. This may seem unrelated to classroom management; but I really believe that, no matter what type of student you have, he/she will be at their best in an environment that is well-structured and organized. I straighten my classroom every day before I leave so that I can walk into a neat and clean room every morning. This just starts my day better and helps me feel calmer. I think a neat classroom does the same for my students. If your room is overtaken by clutter, the desks are out of order, there are books/papers/trash everywhere – the environment does not demand respect or set students up to be relaxed and focused. By making sure that I have a place for everything and a system for most things (late work, papers to return, attendance, etc. ), I eliminate a lot of possible chaos and time for “issues” to occur.